ALL RIGHTS RESERVED. These file may NOT be redistributed in any form or format by any means whatsoever without the express written permission of Mada. You are allowed to use renders with this product for commercial use. 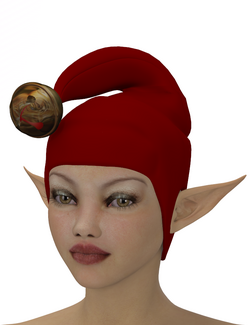 JingleHat is a conforming elf's hat with a bell, created for Victoria 4 by Mada. It was the January 2008 freebie at Faerie Dreams. Jingle Hat Xtras by RedEyeCat adds fits for Michael 4, Hiro 4, Aiko 4, Kids 4, K4-Toddler, Toon Girl Sadie, Toon Boy Sam, and Hein. It also includes ten textures for the hat and four metallic textures for the bell.